Legendary boxer Muhammad Ali died at the age of 74, decades after developing the degenerative brain disease Parkinson's. Parkinson's happens when nerve cells are lost in the brain. It attacks a very specific part of the brain - a small region called the substantia nigra, which plays an important role in movement, muscle control and balance. Shortly after Ali's retirement from boxing in 1981, rumours began circulating about his health. His speech had become slurred, he shuffled and he was often drowsy - recognisable signs of the disease. The symptoms of Parkinson's are usually mild at first, but progress. 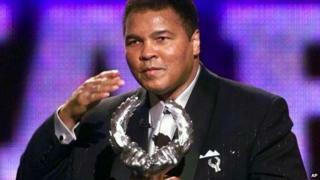 Ali continued to make public appearances, despite his deteriorating health. Towards the end of his life, he had visible tremors and looked increasingly frail. Although his brain disease did not kill him - Ali died following complications linked to a chest infection - it was arguably one of his greatest challenges. Doctors still do not know why people develop Parkinson's disease. A combination of genetic and environmental factors are probably responsible. In Ali's case, his choice of profession may have been important. Despite winning most of his fights, as a boxer Ali took repeated blows to the head. After his famous 15 round "Thrilla in Manila" fight against Joe Frazier he reportedly told his trainers: "Man, this is the closest I've ever been to dying." Some medical experts believe there could be something called pugilistic Parkinson's - Parkinson's caused by chronic traumatic brain injury. But it's still not clear that this is the case. Indeed "punch drunk syndrome" - brain damage linked to repeated head trauma and concussion - is now called chronic traumatic encephalopathy instead, in recognition of the fact that it's not a disease confined to boxers. Michael Stewart and Kieran Whoriskey are both living with early onset Parkinson's disease. Michael, a father-of-two, was 39 when he was told. Kieran was diagnosed at just 26. Kieran describes the disease as "like a twelve-round boxing fight with Mike Tyson. You don't stay down". "I was like a shadow of my former self because I was a confident fellow and it just strips it day by day," he added. He said when he finally admitted his condition the "support I got was amazing, the weight lifted from my shoulders". Diagnosing Parkinson's and its cause can be tricky because there is no single conclusive test. Doctors look at a person's symptoms and brain scans to offer their best prognosis. Although there is no cure for Parkinson's disease, there are treatments available that can lessen the symptoms and help patients maintain their quality of life. Physiotherapy can help with the muscle stiffness and walking problems. Speech and language therapy can help with swallowing difficulties. Drugs like levodopa can help with many of the symptoms of Parkinson's, but with prolonged use they can cause unwanted side effects, including uncontrolled jerking movements. Scientists are working hard to find a cure and better treatments, spurred on by the support of high profile campaigners, such as the actor Michael J Fox, seeking to raise the profile of the disease. While he was alive, Muhammad Ali helped set up a Parkinson's research centre that bears his name. Dr Holly Shill, director of the Muhammad Ali Parkinson Center, paid tribute to Ali, saying: "I have watched him face the disease with grace and humour, and he has inspired countless patients to do the same. "We have lost a great warrior in the battle of Parkinson's, but hope continues for a better tomorrow."